When my boys were all about Makenzie's age I remember teaching them how to ride a bike. We would load up into the car and head to a flat grassy park near our home. It was here they would allow mommy to take off the training wheels and let go because the fear of falling was lessened by the soft blanket of green grass underneath their wheels. There however came a day when the grass had to be traded in for the sidewalk. That hard unforgiving slab of concrete reached up and scraped all of my boy's knees and elbows a time or two! I remember scooping them up and sitting on the front porch inspecting the damage while they sobbed. Today I scooped Makenzie up off that very same slab of concrete. It was a beautiful day. Makenzie made her way to the front door a couple of times before I finally asked her if she wanted to take her walker outside to play. She smiled from ear to ear so out we went. I grabbed my camera on the way out the door, super excited to have some natural light, and we made our way to the sidewalk. Makenzie walked and giggled. She teetered on the edge of the curb so we made our way off the sidewalk and onto the road giving her more room to roam. As Makenzie walked back up our hill to the house she stopped stepping and put her head down telling me she was done. I rolled her back up onto the sidewalk and turned for s split second to set my camera down when I heard it. CRASH! I turned around to find my baby girl face first, eyes wide with terror, in the gutter. I scooped her up, just as I have done many times before, and walked with her in my arms to the porch. About half way there she started to sob the most normal mommy I have an owie sob I have ever heard. I held Makenzie tight while I gave her the once over and inside we went. Makenzie got her first goose egg on her little head and a scratch on her hand. She cried for a good long while. She and continued on and off with the notorious sputter and the pouty lip in between her tears while I waited for her doctor to call me back. The doctor went through the all to familiar signs of a head injury which Makenzie presented none of. I expressed my guilt and the doctors response was.... I am so glad you and Makenzie got out today. She will be fine. Just watch her. So I watched her. She began to smile and laugh and I felt much better. I called her PT and after asking me if Makenzie was ok, she laughed .... "Makenzie is mobile now, this won't be the last time she falls down! Stop beating yourself up!" The thing is, with a special needs child, the mommy guilt is so much more intense because we are their protectors 24 hours a day. We should be able to keep them out of harms way. Whether it is falling down, getting cavities, keeping them out of the hospital, stretching and moving them to keep away contractures and pain, or what ever the outside force may be. The reality is, I can't keep Makenzie in a bubble. 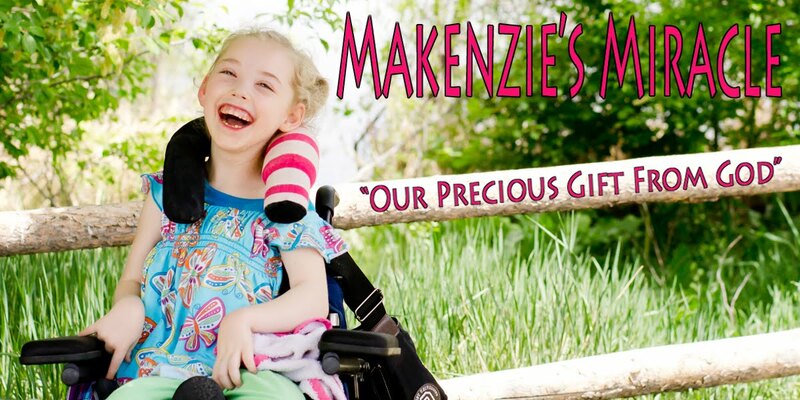 This new mobility Makenzie has learned is a step in the direction of independence. Sometimes we fall and get a bit scraped up in the process. I am so proud of Makenzie and can't wait until it is nice enough to go outside (with a helmet) again!